These articles written by PSfPS give our perspective on the latest psychological and consultancy research, principal themes, topics and trends prevailing in the professional services industry at this time. Our aim is to give a point of view that provokes further thought and discussion and ultimately leads to mind-set and behaviour change amongst those working within the professional services industry. We’ve known for a while that Psychological Skills for Professional Services (PSfPS) isn’t the right name for our business. Clients have told us it doesn’t properly represent what we do and doesn’t say anything about our values or the way we work. On a more practical level it’s hard to remember, say and type. That’s why on Friday PSfPS will become The Openside Group. These changes are about improving and tightening our focus, not about changing the way we work with you. Rest assured that we’re going to remain the same open, friendly and good-humoured business we’ve always been. Our success will continue to be determined by your success. Our select team of tutors will continue to deliver programmes designed to fit your context. We remain steadfast in our belief that intensive, face to face, interactive programmes are the best way to develop the critical behavioural skills required in professional services. There are few issues that provoke greater debate, interest and often tension within the Partner group of a professional services firm than Partner compensation and how Partner contribution should be managed and assessed. So it was with interest that we read the ‘Partner Contribution and Reward Survey 2017’ by Performance Leader, Managing Partners’ Forum (MPF) and Internal Consulting Group (ICG) into the current trends in ‘Partner Contribution and Compensation Management’ within professional services and advisory firms. One particular issue highlighted by the study, which continues to have significant impact on the majority of professional services firms is the obsession with short-term, narrow, ‘activity-driven’ financial metrics such as billable hours and utilisation. In this Point of View article we examine the particular impact these ‘activity-driven’ metrics have on client relationships and the firm’s staff. We then investigate whether the traditional culture of professional services firms – underpinned by billable hours and utilisation metrics – is compatible with the ambitions, expectations and attitudes of junior staff members. Finally, we outline our recommendations for professional services firms including alternative pricing structures firm’s could adopt with clients not based on ‘activity’ metrics and examples of firms already doing this and metrics firm’s might use internally to assess contribution and determine reward beyond ‘activity’. Up until now most research and writing around this subject has assumed the context of a classic hierarchical organisational structure. An area that has received far less attention however, is how performance should be managed within the dynamics, politics and structure of the professional services firm’s Partner group. Part 1: The Macro Perspective: Is the definition of Partner “No more development required”? We examine the current state of Partners’ attitudes towards performance management and its standing in the Partner group. We examine the actual performance management activities that are currently undertaken within Partner groups. Our Five recommendations to significantly improve the management of performance within the Partner group. It’s highly unlikely that anyone anywhere would either attempt, or be able, to catch a ball by simply learning the formula. In recent conversations with Clients around developing leadership skills, it occurred to me that the same was essentially true about Leadership. That’s not to say that academic and theoretical approaches to leadership are wrong, merely that the analysis and conclusions are attempts to codify the practice, much like the formula for catching a ball, and equally like catching it’s unlikely anyone could learn the behaviours by learning the formula. The behaviours required of professional services leaders are rarely taught ‘formally’ but instead have to be learned, practised and refined through explanation, modelling, coaching and feedback. Here’s our hypothesis: A firm’s consulting methodologies and tools are important but they are not enough in themselves. 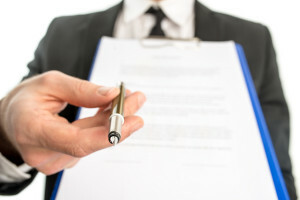 To suitably test our hypothesis, we needed to find a list of the best performing consulting firms, where financial performance wasn’t the sole indicator of success, where firms explain what they believe are the secrets to their success and where performance has been independently verified by an objective group of assessors. In Part 4 of our Special Report, we outline how we believe professional services leaders can adopt a ‘Broken Windows’ strategy in their firm to alter their employees’ antipathy towards training initiatives and to prove that “the way things are done around here” can change. David Maister was right, (most) training in professional services firms is still not achieving the results stakeholders would want to see. It’s time for the leaders in your firm to start fixing some broken windows. In this four part special report, we examine why David Maister’s assertion that “the majority of business training is a waste of money and time” is still worryingly pertinent in many professional services firms over a decade later. Part 1 of the series outlined the continued scepticism of participants towards training in professional services and Part 2 of the series, examined the negative perceptions of leaders’ attitudes towards training held by many in the workforce and why these prevailing beliefs might beg the question “what’s the point of training?” for many in professional services firms. 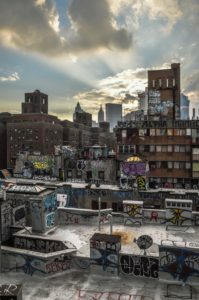 In Part 3 of our report we introduce the ‘Broken Windows’ strategy adopted by Rudy Giuliani in the early 1990s to reduce the high levels of crime in New York and illustrate how this novel approach to policing fundamentally shifted the population’s mindset from that of apathy and resignation at the situation, to one of unity, social responsibility and strong values. It will become clear how leaders can use key components of the ‘Broken Windows’ strategy in their own firms to improve the effectiveness of their training strategy. 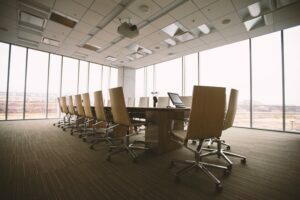 In this four part special report, we begin by examining participants’ continuing scepticism of training based on their overriding perceptions of leaders’ attitudes towards the training programmes they attend and the perceived value – or lack of it – placed on what they have learned once they return to the office. Parts 3 and 4 then suggest how leaders can turn the situation around in their firms, by adopting a ‘Broken Windows’ strategy as famously used in New York in the early 1990s. Part 1 of the series examined the continued scepticism of participants towards training in professional services. How top professional services advisors answer difficult questions, even when the response might be hard for the client to hear. The reason politicians are so adept at avoiding the question is down to what has been coined ‘Communicative Conflict’ – when all possible responses have potentially negative consequences but where a response is still expected. 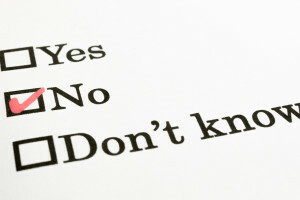 Unequivocally, avoiding the client’s question is not an option for professional services advisors. Even when advice might be challenging for the client to hear, avoiding the question will damage your credibility, your firm’s credibility and give the client far less confidence in your ability. However, it is also true that those working in professional services do sometimes have to deal with a form of ‘Communicative Conflict’ when dealing with clients. 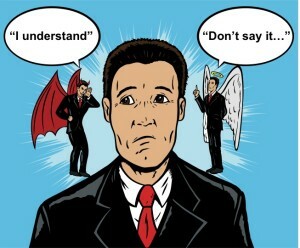 There are occasions when advisors know the advice they must give will be contentious or perhaps not what the client wants to hear. As the Management Consultancies Association (MCA) launches its Consulting Excellence Academy and the associated “Guide to Professional Development in Consulting Firms“, we examine why three key challenges facing the management consulting industry mean now is the time for firms to revisit their professional development strategies and to shift the balance of their activities from the development of technical/knowledge-based skills to behavioural and cognitive skills. The England rugby team are one of the world’s top performing sides of recent times. For over 12 months, they have consistently performed at a higher level than the competition. They are on a national record winning streak and are very close to equalling the world record for consecutive victories. In common with most high performing teams, England’s meticulous approach to each game could be a case study on planning, practice and preparation. For 16 games in a row, this meticulous approach to practice had been a winning formula and for the next game against Italy, there was little reason to doubt its effectiveness. Italy would have to do something pretty extraordinary to have any chance of stopping England increasing their winning streak to 17 games. In the event, Italy were extraordinary. They implemented a unique tactic that had rarely been seen on a rugby field before. Despite hours of practise and detailed preparation, England simply could not adapt to solve the problem they were facing. This was an approach they had never envisaged. They could barely work out what was happening and they were seemingly facing playing patterns they hadn’t seen before. Why, despite hours of expert analysis, scenario planning, drills and practice were the team unable to think critically when it really mattered to solve the problem? England were struck by a phenomenon that has been known to affect high performing teams: when intuition overrides the ability to think critically. In a business context, this ‘intuition-bias’ creates an interesting paradox. It is commonly held that the best way to ensure optimal performance in various business scenarios is to prepare, practise, role-play and simulate the expected interaction/presentation/situation, so when faced with the real-life scenario you can perform to your best. Yet, when faced with a unique or unforeseen circumstance, too much practice can be detrimental to performance. As the well-known saying goes: a virtue has become a vice. Our article outlines how firms can ensure they avoid the intuition-bias, namely, by considering how they practise. Rather than simply practising deliberately, high performing teams need to ‘think deliberately’. The article outlines how managers and coaches can ensure their teams constantly develop their critical thinking skills so that even if they face an extraordinary situation, they have developed the cognitive flexibility to think on their feet and solve the problem. So how do consultants offer clients a challenging but necessary point of view without being discounted? How do consultants get their clients to say “That’s fair enough” and ask for more information rather than “That’s far enough” and start scanning for an escape route? 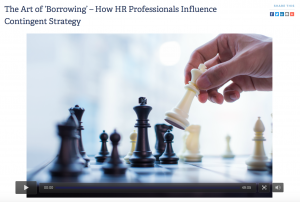 Our Managing Director, William Johnson, recently took part in a webinar for the Human Capital Institute (HCI) with Paul Vincent (Vice President of Global Talent Supply Chain Strategy, Kelly Outsourcing & Consulting Group) on the role of structured analytical thinking in resourcing and talent management decisions. Yes, it is a sweeping generalisation (the definition of an aphorism is “a pithy observation which contains a general truth”) and doesn’t represent most of the consultants with whom we work. Yet, for others, the quote will be a little too close to home. 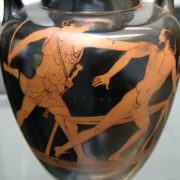 Our article is based on the Greek mythological story of Procrustes, the macabre owner of an inn who developed a special bed that would fit any traveller who lay upon it. Unfortunately, all was not as it seemed… the bed didn’t resize to fit the traveller, the traveller resized to fit the bed. In this Point of View article we examine Procrustean solutions in more detail – when a client is made to fit a pre-determined solution (bed) rather than the solution being specifically tailored to fit the client – and how they might negatively affect two key aspects of a consultant’s work: analytical problem-solving (the bedrock of strategic consultancy projects) and business development. But how can organisations ensure they access the right talent with the required skills at the right time? This is a conundrum for many of our clients and given the number of variables at play, it is not an easy one to overcome. To help us understand the options in more detail we spoke with Paul Vincent, Head of Global Talent Supply Chain Strategy at KellyOCG. What ringtone would your clients have for you? Throughout 2016 we were regularly asked by clients on our programmes: How can we make our firm stand out from the competition? How can we get new clients to buy from us and how can we get our existing clients to refer more contacts to us? The key is this: it doesn’t matter why you think you are different or why you think clients buy from you. All that matters is what the client thinks. Your firm’s difference, uniqueness and strength is in the mind of the beholder; it is a function of the client, not your professional services firm. To get new clients and to get existing clients to refer more business you need to have a clear understanding of the client’s perspective of your firm. What do they really think of you? What do they admire or dislike? Why do they buy from you and why do they (or don’t they) refer you to their own contacts? 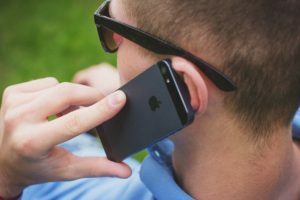 If your clients had a ringtone for you (or your firm) what would it be? Would there be a difference between the ringtone you thought they had and the one they actually have? Why the critical factor for success in professional services is not simply expertise (IQ) but emotional intelligence (EQ). What is emotional intelligence and why is it so important in professional services? Why is Emotional Intelligence still underdeveloped in Professional Services Firms? Our latest Point of View article examines the fundamental role of emotional intelligence (EQ) in professional services. The article suggests that while high levels of expertise (IQ) is important, it is not enough on its own. Why? Because what truly determines the success of a professional services firm is the ability of your experts to start, nurture, influence and manage relationships with clients. It is how your specialist experts interact with clients to distinguish the firm from other potential service providers and it is how your technical experts react and behave during the essential ‘human’ interaction element involved in providing a service. In short, the critical factor for success in professional services is not simply expertise but emotional intelligence. The article examines the importance of developing emotional intelligence to lead and progress in the unique political and cultural dynamics found in many professional services firms and asks why, if emotional intelligence is so important, is it still underdeveloped in many firms compared to technical skills and knowledge? 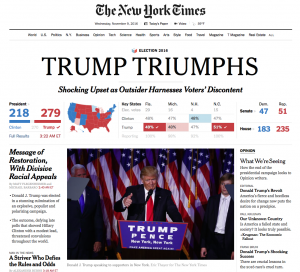 The world is trying to come to terms with the fact that Donald Trump has won the US Election. Brexit plus! How did this happen? What now? It’s because of a white, working-class revolt, it’s because of James Comey, it’s because Trump was impermeable to scandal, it’s because of Wikileaks, it’s because Trump is anti-establishment personified, it’s because Trump was a marketing genius, it’s because people despised the Clinton dynasty, it’s because neoliberalism is a flawed ideology, it’s because of voter suppression, it’s because a significant number of US nationals are inherently racist and/or sexist. It’s time for some structured thinking. Clearly some of these hypotheses are more likely than others – while others are just offensive to many voters. The critical point is this: they are only hypotheses. Hypotheses that need to be rigorously tested. They are not conclusions. In this Point of View, our advice for the US Democratic party is this: to formulate a valid and reliable action plan, pause, take stock, and adopt a rigorous, hypothesis-based structured analytical thinking approach as used by high-level consulting firms. Why? Because, similarly to the challenges currently faced by the US Democratic party, consultants are often asked to solve unstructured, complex and ambiguous problems by clients who want clear actions and recommendations very quickly. So said Paul Bloom in the Harvard Business Review of September 1984. While much has undoubtedly changed since Bloom wrote his article, in many firms the attitudes towards the role of marketing have changed little in over 30 years. Indeed, recent research suggests that many professional services firms remain ‘two-tier organisations’ with marketing – and other ‘support functions’ – very much in the lower tier. Why is marketing often viewed as a ‘second-tier’ function? In our view, it’s firstly because of the prevailing sceptical attitudes of some partner and fee-earners towards marketing professionals and secondly the perceived value created for the firm by ‘traditional’ marketing activities, that is, they could be a waste of effort with marketing teams only controlling those activities which matter least. To overcome these two challenges, we believe it is time to redefine the role of marketing in a professional services firm. The emphasis for marketing teams needs to shift to supporting those activities that are at the foundation of a professional services firm’s success: namely, the critical interactions that occur when creating new and strengthening existing client relationships. In our view, the dominant role of a marketing manager in a professional services firm should be to act, in effect, as a ‘consultant’ or ‘coach’ to the partner group. The marketing/partner relationship should mirror that of the professional advisor (fee-earner)/client relationship. This new role will require a re-evaluation of the core skills expected of marketing individuals, in contrast to the skills developed in a traditional marketing curriculum and career. 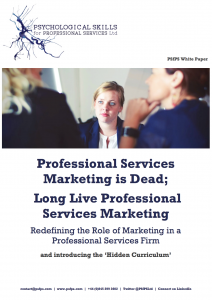 We believe there is a ‘hidden curriculum of professional services marketing’ that will give marketers the skills and abilities to succeed in their new role as strategic ‘consultants’ to the partner and fee-earner group. Only by redefining the role of marketing to focus on those activities that add real value to the firm and by developing the ‘hidden’ skills and abilities required in a consulting capacity, will marketing teams be able to truly add value to the firm and prove to hitherto sceptical partners that marketing deserves a place at the top table. There are several advantages of eLearning (outlined in this Point of View) and it is easy to understand why clients and those responsible for training might prefer online programmes for their organisations. We’ve always experienced some discomfort about the idea of providing a skill development programme designed for women-only groups, despite the demand from organisations and women themselves. Recently our discomfort has been echoed by some of our clients who have concerns that women-only training actually undermines equality. In this Point of View we examine the role of women-only training and how we believe it fits into the bigger picture in the workplace. We also explore what work needs to be done towards gender balance at all levels of an organisation. Ultimately we believe that women-only development is useful. The supportive, empathetic dynamic of a women- only group, plus the particular challenges that women face from male-stereotyped environments, means that there is a desire from many women (regardless of their seniority) to understand better how their own socialised expectations and the stereotyped expectations of others may have an influence on their behaviour and its interpretation at work. 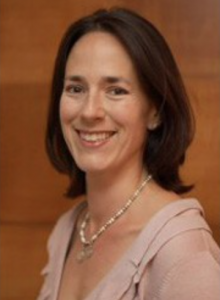 Women-only programmes can provide participants with an awareness of bias and its implications, and opportunity to discuss strategies for dealing with current organisational cultures. They also help build skills in areas where many women have had enough of feeling uncomfortable and at a disadvantage, such as self- advocacy, negotiation on behalf of themselves, asking for things and taking credit. However. And it’s a big however… gender balance in organisations will not be achieved by women-only programmes, or by developing professional skills in women. While we think the content of women-only programmes is both valuable to and welcomed by women, the problem is when the presence of such a programme positions the lack of equality in an organisation as a ‘women’s problem’, or a ‘problem with women’. Wouldn’t it be great if someone could invent a microwave bed? 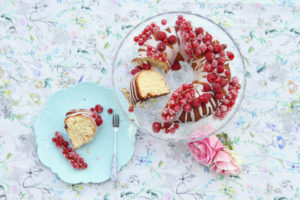 Wouldn’t it be great if we could watch the “Great British Bake Off” and suddenly be Master Bakers? Wouldn’t it be great if we could have a behavioural change programme over a 1-hour lunch break? Property and real estate firms face a real conundrum. It stems from a desire to stop clients seeing them as simply ‘agents’ with short-term, lower value, transactional relationships – what we might describe as a ‘product-based’ approach. Firms would much rather be seen as advisors with long term, higher value, collaborative client relationships – what we might describe as a consulting-led approach. The fundamental problem for property and real estate firms is that every firm has the same objective. As a result, despite their best intentions, firms often say the same thing, use expected stock phrases and at first glance to clients look exactly the same as one another. 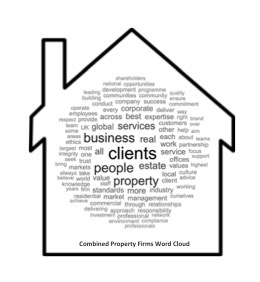 So how can property firms really distinguish themselves from the competition? It begins with understanding that to truly be advisors and consultants – as opposed to agents – they need to adopt a consultative approach that aligns every behaviour, process, action and tool towards the client. What is specific about professional services firms that make them more averse to embracing change? Most training is useless. Just ask David Maister. Despite best intentions, many people who attend programmes to learn new skills and discover fresh approaches simply “go back to the way we have always worked” once they return to the firm. Unfortunately our research, feedback and experience suggest professional services firms are particularly reluctant to change – even if the potential rewards might be great. Why? Why do professional services firms, compared to other industries, have a particular favouritism for the status quo? 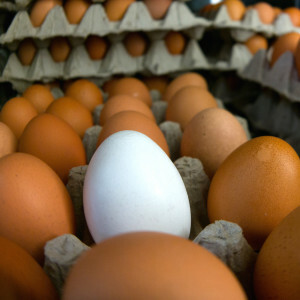 Essentially, it’s because being different is risky and uncomfortable. 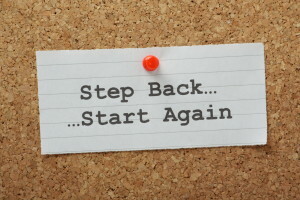 Moving from the status quo requires an acceptance that failure is a realistic consequence of originality. 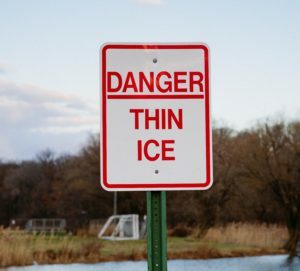 In our experience, the prevailing culture and unique dynamics specifically found in many professional services firms amplify the perceived level of risk and intensify the consequences of failure. As a result, change is more uncomfortable and new ways of working are not always supported. Using our own experiences and some excellent research by Prof. Laura Empson, this Point of View article outlines 10 unique dynamics of a professional services firm’s culture that create a greater barrier to risk-taking, intensify the fear of failure and create a reluctance to try a new, different (but possibly risker) approach – even when the rewards are potentially great. Dynamics outlined in the article include individual autonomy, selective intervention, maintaining social capital, a blame and activity driven culture, power in ambiguity, burden of consensus, social embeddedness, lack of sharing and an obligation to preserve tradition. Consulting Excellence is the ground-breaking new scheme for the UK’s leading management consulting firms. It is a hallmark of quality that enables clients to make a better choice when buying consulting services and commits firms to the highest standards of ethical behaviour, client service and professionalism. As an Associate Member of the MCA we are delighted and proud to sign up to and support this new initiative. To achieve the three ‘Consulting Excellence’ professional development principles, as well as attaining exceptional analytical and business modelling ‘technical’ skills, consultants need to learn and excel in certain ‘non-technical’ cognitive and behavioural consulting skills. To fulfil each key responsibility with distinction requires a consultant to apply a variety of behavioural and cognitive skills throughout their career, many of which will not be intuitive. Having trained management consultants worldwide for over 25 years, in this Point of View article we have identified the core abilities and skills relevant to each responsibility and believe firms who learn, adopt, share and model these skills among their consultants will be best placed to achieve the ambitions of Consulting Excellence. How to stand out when logic suggests your firm should offer all things to all people whilst not appearing too specialist? The success of psychics relies on their subjects displaying two similar cognitive biases: ‘Subjective validation’ and ‘Confirmation bias’. Based on these biases, psychics are successful when what they say is vague and general enough that it could apply to a wide audience and positive enough without being unbelievably positive. Being general enough to appeal to as wide an audience whilst not being too specific for fear you will be deselected. The key paradox for professional services firms is therefore: if cognitive biases and market dynamics mean you have to appear to be ‘all things to all people’ to meet clients’ expectations and yet not too specialist to avoid being discounted, how do you differentiate your firm from the competition without fear of being deselected?! It all comes down to behaviours: the way your employees act in the critical moments of truth once the client or prospect has chosen to engage. It is how you illustrate that, in contrast to other firms, you could create real, tangible value for the client. This Point of View details the cognitive biases and market dynamics that are driving firms to try and appear ‘all things to all people’ while removing the option to differentiate through specialisation. 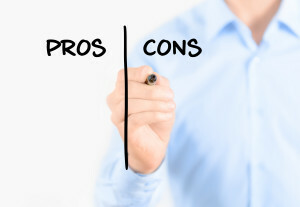 We then argue that while not being too specific, offering many service options and using expected stock phrases might be important to stop your firm being deselected in initial touch points (such as the website) equally, continuing to adopt a cautious approach in the way you behave will also stop you from being selected. “A giant engine in a factory failed. The factory owners had spoken to several ‘experts’ but none of them could show the owners how they could solve the problem. Eventually the owners brought in an old man who had been fixing engines for many years. 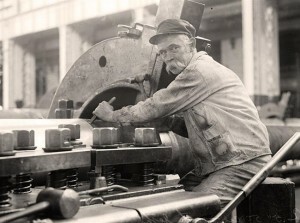 After inspecting the huge engine for a minute or two, the old man pulled a hammer out of his tool bag and gently tapped on the engine. Immediately the engine sprung back into life. It is hard to argue with the moral of this simple tale but it perhaps undersells the different learning points that could be taken by consulting firms (or those organisations seeking to adopt a consultative approach). Using a bit of critical thinking (and imagination!) we think the parable could be used to show implications for firms with regards to consulting skills, business development behaviours and even alternative pricing methods. Biased views? Have you considered all the evidence? We should get something straight right away – this is not another article arguing for or against the EU referendum result. 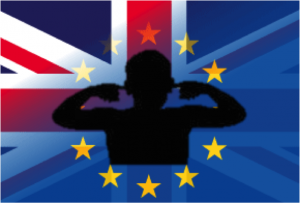 Our Point of View is based on a particularly worrying aspect of the whole EU Referendum debate, namely, the rejection of experts, research-based evidence and facts. We look at the implications for those working in consulting or advisory services and argue that politicians could learn a great deal by following the same critical thinking approach and rigourous, objective enquiry used by high level consulting firms. The crucial point is this: consultants should set out to test their hypotheses, not prove their hypotheses. As Karl Popper said: “If we are uncritical we shall always find what we want: we shall look for, and find, confirmations, and we shall look away from, and not see, whatever might be dangerous to our pet theories. Based on this premise, we examine how a consultant might have approached the EU Referendum as if it were a consulting engagement, adopting a rigorous and critical thinking approach. Finally, the article argues that the EU Referendum should be a wake up call for consultants and business advisers because a consultant who chooses to argue a position based on a personal agenda or presupposed argument seriously risks disenfranchising their clients and formulating mistaken conclusions. 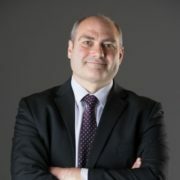 Jeremy Raymond has worked with William Johnson, Managing Director of PSfPS, since the early 1990s and having been interviewed for the book, William is kindly listed as a contributor. The book promotes many of the philosophies and ideas we advocate in our own business development training programmes for professional services firms (and non-traditional service firms who wish to learn from the best practices used within professional services). We have also provided sections from the introduction of the book which give a further flavour of the content of the book. Should you enjoy reading the extracts, we would urge you to purchase a copy here. It is likely you will have seen or heard the ‘Think different’ advertising campaign run by Apple in the late 1990s (“Here’s to the crazy ones. The misfits. The rebels. The troublemakers…). The role of a consultant (or ‘advisor’) is to ‘Think different’, to offer a new perspective, a unique point of view based on an analysis of the client’s situation, needs and objectives. However, as the story above neatly illustrates, it can sometimes be a risky and uncomfortable experience, particularly if the new point of view challenges and threatens the client’s position, judgment and supposed knowledge. It is ironic that, while pitching an idea to ‘Think different’, the individuals who had indeed thought differently were vilified and opposed but would eventually be seen as geniuses – exactly as the commercial’s prose predicted! As a result, it is easy to understand why a consultant may take the cosy option, maintain the status quo and tell the client exactly what he wants to hear. However, choosing this easy option goes against the very essence of being a consultant. Rather than the comfortable, cosy, easy option, this article illustrates why offering a unique point of view has to be the preferred strategy for a consultant and how it is entirely possible to mitigate any perceived risk and to manage client interactions effectively. 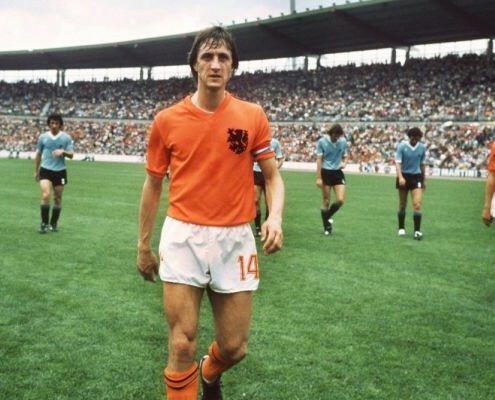 On March 24th 2016, the legendary footballer and manager, Johan Cruyff, passed away. To many he belongs among the hallowed quartet of truly exceptional individuals who have played the game: Pelé, Diego Maradona and Alfredo Di Stéfano. These are players who somehow transcended their sport to become household names and globally renowned superstars, adored by their countrymen and an inspiration to millions. Every organisation has sacred cows – policies, procedures, customs, traditions or even individuals that are untouchable and incontestable. Organisational sacred cows can be fine if they drive positive behaviours, beneficial client relationships and a thriving culture. However, when these sacred cows drive negative, out-dated and unsustainable behaviours, publicly slaughtering one can strongly signal positive change. 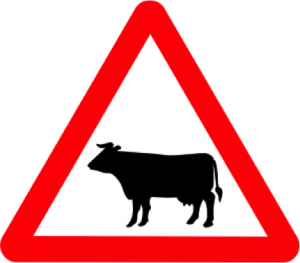 One such sacred cow for many professional services firms (particularly law firms – on whom this article focuses) is the ‘billable hour’. This Point of View argues the top performing firms believe in putting the client first, doing things the right way and having a deeply rooted value set which drives all behaviours and any sacred cow that rewards behaviours directly against these values, such as the billable hour, should be slaughtered. Most organisations across the world are acutely aware of the significant competitive advantage big data and advanced analytics strategies could create for both their own businesses and those of their clients. 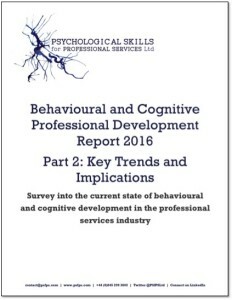 In Part 2 of our Behavioural and Cognitive Professional Development Report 2016, PSfPS have determined the following 10 key trends that will affect the professional services industry and the possible implications for firms with regards to learning and development strategy, managing client relationships and behavioural change. Read the full report, with further detail and explanation about each trend and implication here. Following every PSfPS programme we ask participants a set of questions about how they plan to embed the learning at their firms and what difficulties they anticipate in applying what they have learned. 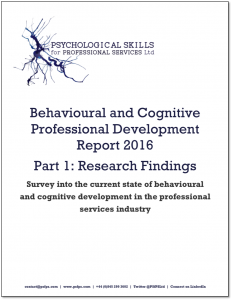 Having analysed over a thousand participant responses to these questions over the past year, we have been able to gain a snapshot of the key issues facing the top professional services firms in the world today with regards to professional development and behaviour change. Our research suggests the fundamental skills and behaviours required of those working in professional services are not intuitive and still need to be codified, learned, practiced and refined, especially in relation to critical thinking, communication, presenting with impact and business development. Using critical thinking as an example, our findings suggest that despite the clear benefits, before attending a formal training event, individuals do not regularly use a structured analytical thinking process in their everyday work. 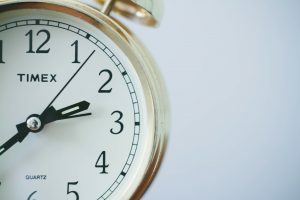 Individuals that do have prior knowledge of the required process and skills, frequently find an inability to apply the theory in everyday activities often due to a scarcity of time (even though the use of the process saves time!) and senior management support. With regards to instilling behaviour change and embedding the learning, participant data shows that culture and prevailing mindsets in professional services firms still create barriers. There continues to be a disparity in some firms between the new behaviours and processes that employees learn, which should be to the benefit of their firms and how their performance is actually measured and rewarded once they are back in the workplace. Similarly, Senior Managers often do not embody the behaviours or know the same processes that they are asking their more junior employees to utilise. ii. The prevailing culture in many professional services firms (short-term, metric-focused, ‘activity-driven’) means behavioural change is not always supported. 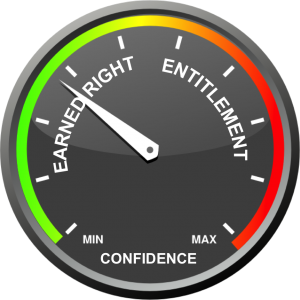 The problem for consultants is that occasionally confidence can be superseded by a sense of entitlement which can also breed complacency. Consultants start to simply go through the motions, often in the belief that whatever they say will be met with agreement and perhaps even adulation. Space exploration is amazing. 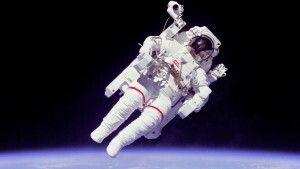 Those who undertake the treacherous journey into space are truly remarkable people. No one would ever dream of sending an astronaut into space who has not learned, practiced and refined certain behaviours again and again in a simulated environment. The results would be catastrophic. The problem in professional services? It is very rare to have the opportunity to practise and fail. The key point about learning and practising in a simulated environment is that you are allowed the opportunity to learn from failure without disastrous consequences. 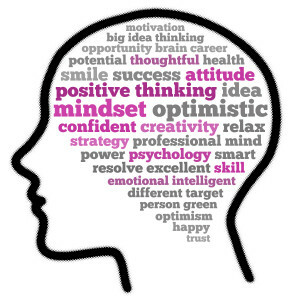 You are able to reframe your thinking and condition your brain to react in a certain way so that, when faced with a similar situation in the real world, you are able to behave rationally and think clearly. 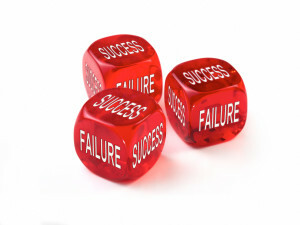 Why then do so many people working in professional services, who have to face potentially difficult and unfamiliar scenarios on a regular basis, decide to practise the required key behaviours for the first time, in real time, where failure isn’t an option – but highly likely? This Point of View examines the science behind learning from practising and failing, specifically relating to the role of the “Amygdala Hijack” (as coined by Goleman 1995), or as we describe it, the ‘foghorn in your mind’. The article argues that learning, preparation, practice, simulation, role-playing, modeling and coaching are the essential building blocks that allow astronauts (and those in professional services), when faced with a real-life scenario, to think straight and turn down the foghorn in their minds. While driving to work last week, I found myself singing along to a few old favourite festive tunes and it struck me that it always seems to be the same songs played on repeat at this time of year. Why haven’t we moved on? What is creating this loyalty? 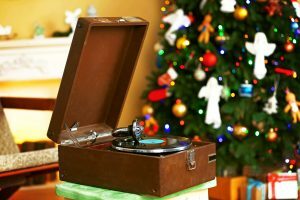 The answer is they are not just songs – they ‘are’ Christmas. 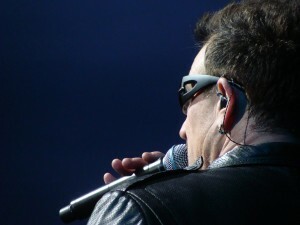 It’s because of what the songs represent, the memories they arouse, the nostalgia and how they make us feel. We continue to make the decision to ‘buy’ these songs and are unwaveringly loyal because of the positive emotions they evoke. Why is this discourse on our choice of Christmas tunes at all relevant to you? The answer is that feelings and emotions play a similarly large part in every business decision. Professional services firms should remember that business decisions are never simply about price, ability, functionality, technical skills or business acumen – which many firms can offer – but about how the firm can differentiate itself by emotional impact. This Point of View examines the most recent science behind emotions in decision-making and provides practical implications for businesses. The Millennial generation, with their unique attitudes and values, combined with an identified skills gap, pose significant challenges for professional services firms but also provide great opportunities if their potential can be harnessed. Based on latest Millennials research, client interviews, surveys and academic articles, PSfPS have written a short series of articles giving our Points of View on the current situation and outlining potential implications for professional services leaders, particularly with regards to learning and development, talent management, HR strategy and future leadership decisions. 1. Who are Millennials and why should professional services firms care? ‘Millennials’ – also known as Generation Y – are individuals who were born in the early 1980s to late 1990s and will come of age in the early noughties (2000s). For some, Millennials are lazy, narcissistic, job-hopping, praise seeking, entitled, skill-lacking, under-prepared digital addicts. Others see them as digitally proficient, adaptable, confident, creative, knowledge-seeking catalysts for accelerated business change. 2. The Millennials’ Skills Gap – so what, why and what to do about it? Recent research of both employers and Millennials has found both groups agreeing that current education systems do not help students attain the required skills and behaviours to succeed in business. This Point of View article outlines potential reasons why education is not giving students the required skills to survive in a real business environment and discusses why the perceived skills gap should be of concern to business leaders in professional services. 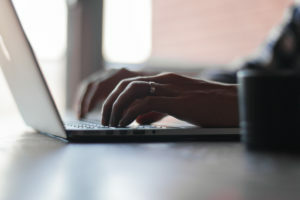 The article finds only a small percentage of business professionals believe that hard skills are more important than soft skills and argues that the fundamental skills required to succeed in professional services are ‘human’ skills, which can only be acquired through human experiences, interaction, coaching, explanation, modelling, collaboration, coaching, feedback and mentoring. Fortunately, it is found that Millennials are keen to learn and develop skills and behaviours that will help them progress throughout their careers. 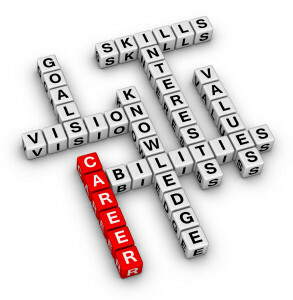 The next step for professional services firms is therefore to determine of what skills and behaviours a rounded business career skillset should comprise and then to establish how these skills and behaviours can be learned, developed, practiced and refined within the firm. In order to formulate a learning and development strategy to overcome the perceived skills gap among Millennials, firms must first define the rounded skillset required to succeed in a 21st Century professional services environment. Fundamentally, Millennials working in professional services will most successfully apply technical expertise and digital proficiency when it is combined with ‘human’ skills and behaviours. Core business operations are all founded on learning and developing core ‘human’ skills and behaviours. Millennials are different, with their own unique attitudes and values. They want to learn and they want to work hard, they just want to learn and work differently to previous generations. Firms who show commitment to the learning and development of their Millennial workforce will gain loyal, committed and engaged employees. This article provides a potential framework that professional services might follow to develop ‘human’ skills among their Millennial workforce. The proposed framework is based on the McKinsey Quarterly article of June 2003 entitled “The Psychology of Change Management”. Capability Building: Professional services firms should ensure that the necessary infrastructure and mechanisms are in place for Millennial employees to learn, practice, develop and then refine the human skills required to succeed in business based on an analysis of individual skills and capabilities gaps. A Compelling Story: Employees will only change their mindsets if they can see the point of change and agree with it, which has interesting implications when considering the learning and development needs of the Millennial generation. Consistent Role Modelling: In order for Millennials to learn the required ‘human’ skills, they must be exposed to “significant other” role models (those in a position of influence) in their professional services firm who “walk the talk” and are able to coach them in and also demonstrate the right behaviours. Reinforcement Systems: The final building block is to ensure that firms put in place ‘reinforcement systems’ such as feedback; appraisals; coaching and opportunities for Millennials to practice newly acquired human skills on an on-going basis, in a live business environment. 5. Can a ‘traditional’ professional services firm’s culture ever be compatible with the attitudes and expectations of Millennials? 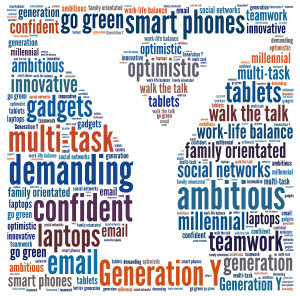 Professional services firms should be under no illusion – the Millennials are coming. In the next few years, Millennials will make up the largest proportion of the workforce and will become the leaders of your firm. Over the last few months PSfPS have extensively researched the role of Millennials in professional services with regards to their attitudes and existing skills set and it has become clear that some firms have already started to adapt their policies and procedures to satisfy the unique attitudes, desires and expectations of their Millennial employees. Can a traditional professional services firm’s culture ever be compatible with the attitudes and expectations of Millennials? Using real examples, this Point of View article examines how firms should start to adapt their cultures (behaviours, processes and mindsets) to become more compatible with the attitudes of their Millennial employees without forgetting that Millennials also have a role to play. Those firms who continue to maintain a ‘traditional’ culture could well be perceived as out-dated and old-fashioned and will not be where Millennials decide to pursue a fulfilling and engaging career. The only way to change a ‘traditional’ culture is to change its associated traditions. Stop eulogising about the past but instead establish new traditions that are compatible with the attitudes of Millennials. Internal Consultants – Organisational Adrenaline or Decaffeinated Consultants? 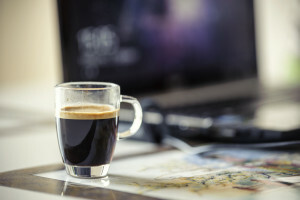 Internal consultants can be like coffee for your organisation. At their best, internal consultants can provide your organisation with the ‘kick’ it really needs to pursue change. When it comes to critical conversations, consultants have a huge weakness. They just cannot help themselves. They know they shouldn’t do it but the urge is too great. It just has to come out. There are those in organisations who would happily say “Good riddance” to consultants. In particular, those who believe consultants cosy up to management, learn at a company’s expense and take the results with them. 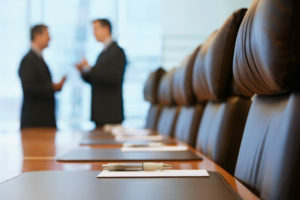 There are others, however, who have had far more positive experiences and are willing to defend the use of consultants against the tough stance that the Board, the Audit Committee and other stakeholders may take. With protagonists on both sides, decision makers in both the private and public sector should continually re-assess when it is right to use consultants – and what they can do to use them more effectively. People across the UK will be pleased to hear that rail unions have called off a strike planned for this weekend. Against many odds and despite a perceived deadlock, this welcome result would appear to be a triumph for the negotiation process. Unfortunately, the characteristics of these difficult negotiations can often be found in many business interactions – both within your organisation (with your colleagues) and outside of your organisation (with clients/suppliers/prospects/competitors). This is why mastering the key strategies to get an acceptable outcome from negotiation is a fundamental skill required in business. It’s hard to be an England cricket supporter at the moment. After being demolished by arch-rivals Australia in the Ashes series without winning a game, the England team were knocked out of the recent World Cup without even making it through the group stages and then limped to a drawn series in the West Indies. Fans and commentators were quick to scoff that this was the problem with the old management regime – an overreliance on facts and figures. But let’s not judge Mr Moores too quickly. Perhaps the data is the best place to look. The Managing Partners’ Forum (MPF) annual awards represent the best in class and current best practice amongst professional services firms. They provide a rare opportunity and set of current data to gain an understanding of what cultural traits the most successful professional services firms exhibit. So what key cultural traits do these market leaders exhibit and what are the lessons that can be learned by other professional services firms? 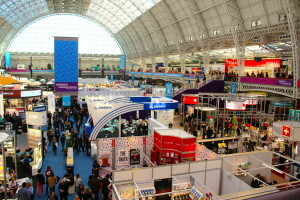 Exhibitions are a key component in the business development toolkit for many organisations. 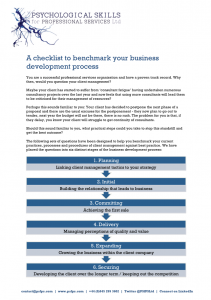 They also provide an opportunity to put into practice some key business development behaviours. 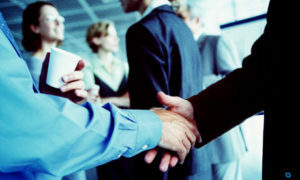 At marketing events, such as exhibitions and networking, the buyers are on the look out to make connections with potential partners. 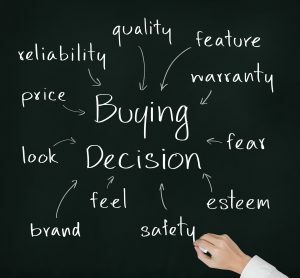 But with a large number of service providers, the process in the buyer’s mind becomes less about selection and initially, more about the elimination of unsuitable providers. A key objective for service providers at these events is therefore to not be de-selected. 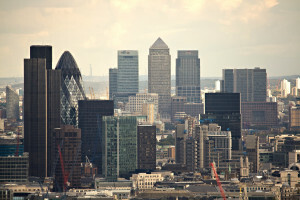 So why are firms de-selected? Why do we resist change and what are the implications on your business behaviour? People are resistant to change. The UK General Election has categorically proved this point. 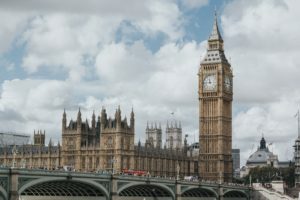 Using the General Election 2015 as a case study, this article looks at why people resist change and the direct implications on your business behaviours. Ultimately, if you understand the main forces of resistance to change, your business can form a strategy that builds credibility, minimises discomfort, wins hearts and minds and gains acceptance. General Election campaigns and gym memberships have a lot in common. When it comes to critical client conversations and understanding how and why clients buy, vote and renew, professional services firms can learn a lot from the sales approaches of prospective general election candidates and gym membership sales teams. That is, learn how it should not be done. In today’s competitive market, there are many reasons why professional services firms might choose not to respond to a Request for Proposal (RFP). 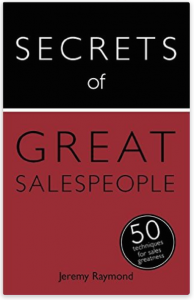 They take considerable amounts of resources to complete and the chance of success is slim. Yet, despite all of the factors that may be stacked against you, many firms must still, or simply choose to, submit a proposal document. 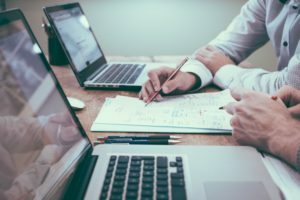 This article offers 10 top tips that you should always follow in order to maximise your chances of procurement success. Is there any point in professional services firms submitting a tender or proposal any more? 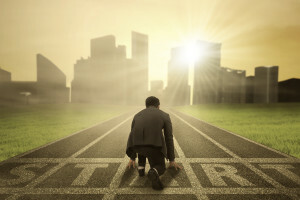 Does the limited chance of success justify the time, money and scarce resources required? Yes, argues Paul Vincent, BUT only if you are prepared to adapt your approach so that it properly aligns with the mind of your buyer.